For Belmont students, this can mean all sorts of things. For a special group of dedicated Belmont alumni, this has come to mean traveling the US alongside Thomas Rhett’s fall arena tour, using their skills and abilities learned from their time on campus on the road. Rhett’s audio crew included five Belmont alumni, while other alumni also worked on different areas of the show. The audio team included Chris Clark, Jeremy White, Trey Smith, Ashley Burns and Shawn Eacott. Each served a different purpose on the tour, yet all worked together to make Rhett’s show sound its best. Clark, who graduated from Belmont in 2014 with a degree in audio engineering technology, served as the front-of-house systems engineer and the audio crew chief. He said that his time at Belmont was helpful in getting him to where he is now, because it allowed him to get connected in Nashville and practice the things he learned in class. “My most memorable moments on campus were working in the Curb Event Center and working showcases with fellow classmates who are now out working with me on the Thomas Rhett tour,” said Clark. He also noted that Adjunct Lecturer Scott Munsell has worked hard to make the live sound program what it is today. “Scott has added many classes to this program as well as increased the curriculum with many important and industry related topics,” he said. For Belmont students, the opportunity to take part in Curb Event Center showcases provides meaningful real world practice. Eacott agreed, saying that his experience working the showcases was a stand out from his time at Belmont. Eacott served as Rhett’s PA tech on tour and graduated from Belmont in 2017 with a degree in audio engineering technology. When looking back at his time at Belmont, Eacott said that the thing that prepared him most for where he is today was his time spent working in the Massey Performing Arts Center under Rusty King. “There were so many valuable things I learned from that hands-on experience,” he said. “I was in a place where it was okay to make mistakes and learn from them, and that helped me grow tremendously.” He also said that King was a great role model for him and other students and shaped him into the professional he is today. 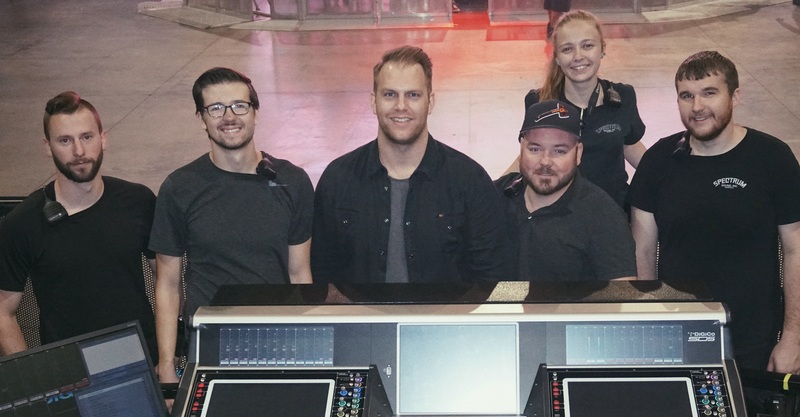 Other Belmont graduates on the Thomas Rhett tour included Lighting Crew Chief Greg Ogne, Lighting Tech Keaton Lovell, Drum/Bass Tech Justin Meeks and Production Manager Kevin Twist.